Cardiff group organises walks in the south Wales area and beyond, including the Brecon Beacons, Black Mountains, Gower, Wye Valley and elsewhere. Walks vary from 2 to 20 miles, and happen on Wednesdays (3 or 4 different distances), weekends and Thursday evenings in summer. Our Friday strollers take a generally short, flat and easy going route, and most months there is a family oriented walk. You’re very welcome to try walking with us, or to get involved in looking after paths and green spaces and opening up new places to explore. 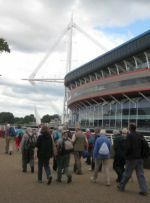 Join the Ramblers and become a member of Cardiff Group. Nant Fawr Trail & Cefn Onn Explore. Cosmeston - Sully Circular from Cosmeston Lakes Country Park. Cardiff Central Strollers visit Cardiff Cemeteries: Cathays. Castell Coch Area from Radyr railway station.